Fortnite is getting a new trap and it is filled with poison! Our Fortnite Poison Dart Trap Guide will walk you through everything you need to know about this new placed trap! We'll feature information on damage, how it works, what it does, and tips on how best to use it in game once it's available! It's been a while since we've gotten a new trap, there was the Chiller Trap that was kind of interesting but didn't really have a ton of use. 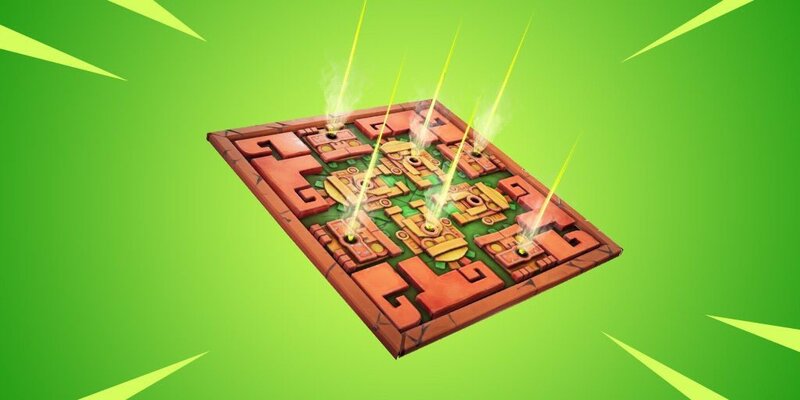 Now, we're getting an Indiana Jones styled trap where you can trick your enemies into walk into it and taking some poison damage. It’s a Poison Trap! Watch your step lest you trigger a trap! The Poison Trap was released on March 27th, 2019! Try to place this in a hallway area so people will unexpectedly run into it from further away. This thing is largely going to be good for catching people off-guard when running down corridors. Most people are used to looking for traps over their head, not worrying about head into hallways. The damage doesn't stack if someone is hit multiple times. It only refreshes the duration of it which is 7-seconds. This does 80 damage over time, so no one is going to be instantly near death when they get hit by it initially. You will still need to play safe and hit good shots on someone. The damage is only applied to health and bypasses shields just like the storm. Hi I was playing a fortnite match it was a 1v1 I hit my opponent with a spike trap then this dart trap so he should of died if he didn’t use bandaids but he didn’t med up beside use a mini shield it was over 10 seconds of time since I hit him with it he should of been dead so I lost what should have been a easy game. By the way the garbage player shot me down as I was going down the mountain so i died of fall damage.